LOS ANGELES - Delbert Mann, who transformed Paddy Chayefsky's classic teleplays "Marty" and "The Bachelor Party" into big-screen triumphs and helped bring television techniques to the film world, died Sunday. He was 87. Mr. Mann died of pneumonia at Cedars-Sinai Medical Center in Los Angeles, his son Fred said. Mr. Mann's 1955 feature version of "Marty" won four Oscars: best picture and director, best actor for Ernest Borgnine, and best screenplay for Chayefsky. The low-budget film with mostly little-known actors told the stark, poignant story of Borgnine's 34-year-old Brooklyn butcher who felt he was too ugly to find love. His life is changed when he meets an equally shy but sweet woman played by Betsy Blair. "I knew we had a good story, because I had already done it on television," Mr. Mann once told The Associated Press. "But I certainly never expected it to be the hit that it turned out to be." 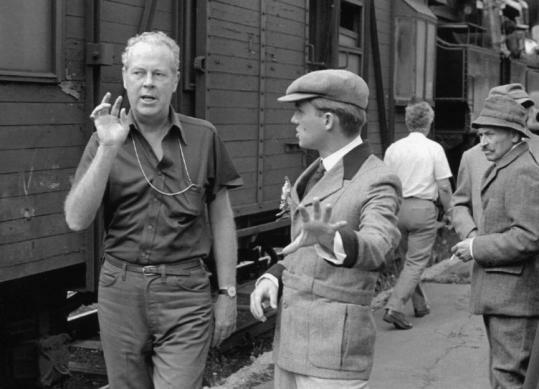 Using techniques he brought from television, Mr. Mann took a mere 16 days to shoot the film version of "Marty," plus an additional three days for retakes. This compared with 45 days for typical features of that time, with epic pictures running far beyond that. Yesterday, Borgnine recalled that when his wife asked Mr. Mann why he had not worked with her husband since "Marty," Mr. Mann said: "I didn't want to spoil perfection." "Can you imagine that?" Borgnine told the Los Angeles Times. "What a tribute to me, and what a tribute to the picture. He was that kind of a fella." Describing Mr. Mann as "the quietest, most wonderful guy," Borgnine said he "was the kind of director that you get home at night and say to yourself, 'Gee, I gave a pretty good performance,' without realizing that he was the guy that got it out of you." Actress Eva Marie Saint, who appeared in numerous live and filmed TV productions directed by Mr. Mann, told the Los Angeles Times he "was just a prince of a guy." "You never heard a word against Delbert," Saint said. "He was wonderful on the set. He was so patient, and you take your cue from the director so it was a quiet set." "If something really went wrong, he could raise his voice, and when Del Mann raised his voice everybody listened because he never did." Mr. Mann was a two-term president of the Directors Guild of America between 1969 and 1971. "Del once said, 'I am a lucky man. I have been able to spend my life doing what I love to do the most,' " guild President Michael Apted said in a statement. "Well, we were the lucky ones . . . lucky to have been part of the audience for his great creative contributions in film and television." Mr. Mann followed "Marty" with 1957's "The Bachelor Party." They were some of the first examples of television's emerging role in Hollywood, not necessarily as a rival medium, but as a synergistic one. The two teleplays were first seen in 1953 on "Philco-Goodyear Playhouse," considered one of the best dramatic anthology series of television's Golden Age. Rod Steiger played the title role in the television "Marty," while the woman he befriends was played by Nancy Marchand. In all, Mr. Mann and famed producer Fred Coe collaborated on more than 100 of the live Sunday night "Playhouse" productions. Mr. Mann's other feature credits include "Desire Under the Elms" (1957), "Separate Tables" (1958), "Middle of the Night" (1959), "The Dark at the Top of the Stairs" (1960), "The Outsider" (1961), "That Touch of Mink" (1962), "A Gathering of Eagles" (1963), "Dear Heart" (1964), "Fitzwilly" (1967), "Kidnapped" (1971), "Night Crossing" (1982), and "Bronte" (1983). Despite his success with feature films, Mr. Mann longed for his television roots and in the late 1960s returned to the medium after a lengthy absence. He directed a string of prestigious prime-time productions, including "Heidi" (1968), "David Copperfield" (1970), "Jane Eyre" (1971), "The Man Without a Country" (1973), "All Quiet on the Western Front" (1979), and "The Last Days of Patton" (1986). Through no fault of her own, "Heidi" enraged professional football fans across America on Nov. 15, 1968, when NBC decided to cut away from the dramatic final minutes of a New York Jets-Oakland Raiders game to begin the television movie at its scheduled time. A native of Lawrence, Kan., Mr. Mann received his first dramatic training at Vanderbilt University, graduating in 1941. He later attended Yale's School of Drama after a stint as a bomber pilot in World War II. Mr. Mann went on to take a directing job at the Town Theatre, a community playhouse in Columbia, S.C., succeeding Coe, who became Mr. Mann's mentor. Mr. Mann's wife, Ann Caroline, died in 2001. In addition to his son Fred, he leaves sons David and Steven.